13 juillet 2016 par Michèle T.	| Nos suggestions adultes. Langue : Anglais. Genre(s) : Nonfiction. 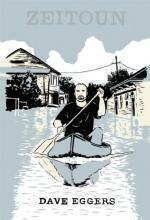 This is the true story of Abdulrahman and Kathy Zeitoun who were living and working in New Orleans when Katrina hit. Kathy left with the children but Abdul stayed to look after his properties and salvage what he could. The two called each other every day but after a week, Abdul stopped calling. Kathy was extremely worried and thought that he was dead because of the news footage showing looting and violence. But Abdul was not dead, he was in prison. For being a muslim after 9/11? He did not know because he was not told what he was accused of and spent time in a maximum security jail. A hard-working man who was a good samaritain, who saved lives during the flood and came to the aid of abandoned animals! It is truly scary how things get out of hand when the rule of law disappears. Those of you who want to know what happened to Abdul and Kathy after the ordeal can google them: you are in for a shock!